What a bold, mad act of genius it was, to make ''Lawrence of Arabia,'' or even think that it could be made. The impulse to make this movie was based, above all, on imagination. 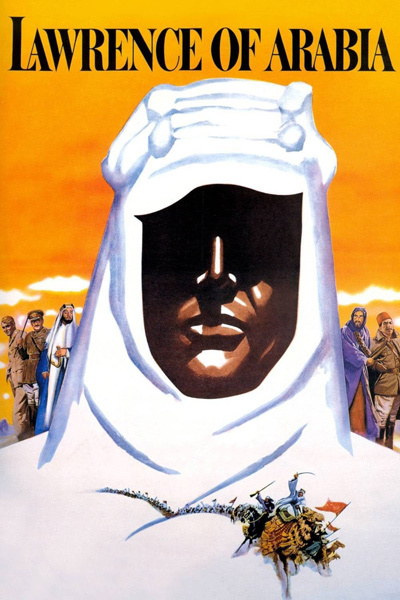 The story of ''Lawrence'' is not founded on violent battle scenes or cheap melodrama, but on David Lean's ability to imagine what it would look like to see a speck appear on the horizon of the desert, and slowly grow into a human being. ''Lawrence of Arabia'' is not a simple biography or an adventure movie--although it contains both elements--but a movie that uses the desert as a stage for the flamboyance of a driven, quirky man. Although it is true that Lawrence was instrumental in enlisting the desert tribes on the British side in the 1914-17 campaign against the Turks, the movie suggests that he acted less out of patriotism than out of a need to reject conventional British society, choosing to identify with the wildness and theatricality of the Arabs. There was also a sexual component, involving his masochism. To see it in a movie theater is to appreciate the subtlety of F.A. Young's desert cinematography--achieved despite blinding heat, and the blowing sand, which worked its way into every camera. ''Lawrence of Arabia'' was one of the last films to actually be photographed in 70mm (as opposed to being blown up to 70 from a 35mm negative). There was a hunger within filmmakers like Lean (and Kubrick, Coppola, Tarkovsky, Kurosawa and Stone) to break through the boundaries, to dare a big idea and have the effrontery to impose it on timid studio executives.